Stay up-to-date in health care ministry as cultural and spiritual heterogeneity increases! 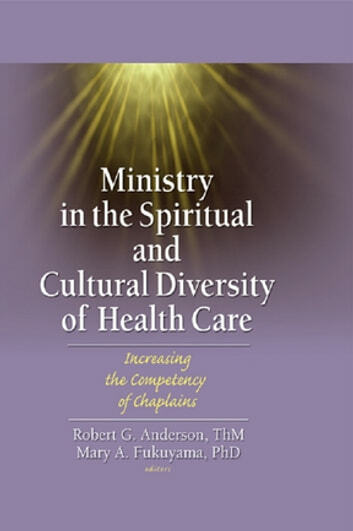 Ministry in the Spiritual and Cultural Diversity in Health Care: Increasing the Competency of Chaplains identifies concrete methods for improving the provision of pastoral care to culturally and religiously diverse patients and/or residents. Experts from both inside and outside the profession-with established records in cross-cultural work and experience with religious diversity-discuss in detail the multicultural revolution that has challenged the traditional health care delivery system. With this timely resource, you will be able to respond to the requests and desires of patients and their loved ones with compassion and consideration for their cultural and spiritual backgrounds. 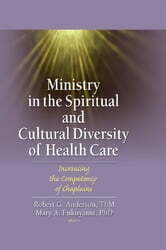 Ministry in the Spiritual and Cultural Diversity in Health Care explores the challenges for the spiritual care professional in health care to address the emotional, cultural, and spiritual needs of a patient without assumption, bias, or discomfort for either person. In addition to advice, recommendations, and real-world examples and case studies, this valuable resource provides a guide for chaplaincy supervisors to use when training chaplain students to impart such unprejudiced care. The book is devoted to establishing chaplains who are clinically trained and certified to contribute to the increasingly pluralistic and global health care context with assorted religious, spiritual, and cultural values, beliefs, and practices.